I'm going to start with the super-easy ways to put dinner on the table. Meals in this category may not be as pristinely healthy as I'd like but they work well for a busy family. I'm suggesting them as a way to kickstart eating at home and begin the process of saving money on a food bill. Somewhere in town, there's likely an entrepreneur or small business that sells entrees, side dishes, and desserts made in small batches just like (or close to) homemade meals. I sometimes buy items freshly made or available frozen and requiring simple reheating. This caterer or catering company may have a traditional storefront or may operate a commercial kitchen at home and make deliveries. So it makes sense to ask around to find prepared meals that fit my preferences and budget. Many cities have quick-serve restaurants that specialize in Chinese or Japanese food at competitive prices. Meals may include a protein, vegetables, and starch (usually rice or noodles). When my kids were younger, they loved Chinese food and even ate the veggies that accompanied these meals. Similar to catered dishes, prepared meals are often available at my local grocery store. These may include salads like chicken salad or broccoli salad; side dishes like twice-baked potatoes; and fully cooked entrees such as rotisserie chicken.Quality and cost can vary. But the convenience section of the local grocer can be a good choice compared to fast food or a pricey dinner out. There are some decent choices in the frozen food aisle of the grocery store, especially Trader Joe's. These include easy-to-prepare all-natural pizzas, microwaveable pastas, and veggies (along with lasagnas that I occasionally served my kids when they were growing up). Quick-serve restaurants may not always deliver the healthiest foods but I am can often get a good meal without consuming loads of fat, sodium, and processed ingredients. Chains like Panera Bread offer reasonably healthy meals at prices well below fine dining establishments. 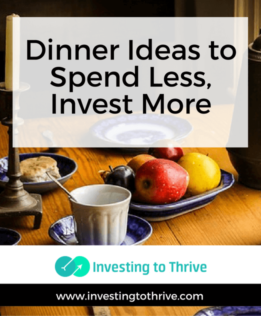 Though I may spend a bit more on these meals, I'll save on utility costs associated with preparing meals and cleaning up pots and pans. According to my instructor at a community college class on cooking, most people eat the same dishes over and over. They rotate their favorites every week or so. For variety, they periodically add new meals to the rotation and take out well-used ones that are no longer interesting. Toss boneless, skinless chicken breasts in a baking pan and drizzle with olive oil, lemon juice, and herbs. Cook on 450 degrees until done (about thirty to forty minutes). At the same time, roast vegetables such as cauliflower, kale, or sweet potato fries in the same oven until done. Place noodles in boiling water, remove from heat, and cover with a lid. Noodles should be cooked in about 30 minutes. Brown some hamburger meat (or pull out meat from the freezer that's previously been cooked) and/or saute vegetables like green peppers, onions, and mushrooms. To these ingredients, add prepared spaghetti sauce (generally store bought but occasionally homemade), heat, and then simmer until cooked thoroughly. Serve sauce over noodles and sprinkle with your favorite cheese. For an omelet, saute vegetables (peppers, onions, spinach, mushrooms, etc.) in oil or butter in a frying pan, then add eggs and cheese until done. For a quiche, prepare a pastry shell; add cheese, cooked vegetables, eggs, and a dash of milk or cream; cook at 350 degrees until done. Place a beef roast in a crockpot (I like eye-of-round roasts) along with vegetables like mushrooms and carrots, dried onion soup mix, and cream of mushroom soup (make your own or buy an organic version) and cook for several hours on low until done but not too dry. Fix some brown rice to go along with the roast for a nice meal with little effort. I may use these simple go-to recipes, ask friends for theirs, or, as tastes and preferences change, develop more dinner ideas that are quick and easy. At first I considered the idea that most people eat the same things over and over a little depressing, but then I found comfort in knowing that I didn't have to constantly try out new recipes in order to be a proper cook, save money, and eat well. I recently had the opportunity to try a meal delivery service (Blue Apron) as I relished the chance to limit grocery shopping soon after having a minor surgery. Recipes and ingredients were delivered fresh to my home and carefully packaged and labeled indicating their assigned meals. For example, a small brown bag contained demiglace, spices, cheeses, and nuts for a specific meal. What I didn't like about the program was the expense (about $10 per person for each meal), lack of leftovers for my lunches, and the time intensity of the recipes. Prepping the food usually took twenty or thirty minutes, not the ten minutes typically indicated on the recipe cards. Cooking time was generally accurate though nearly every moment was consumed with stirring, mixing, and prepping the next element of the meal. I had to actively cook these meals, not toss them in the slow cooker and forget about them until dinnertime or simmer for an hour while relaxing or handling another chore. Using a meal delivery service can be helpful. It might also be worthwhile to avoid grocery shopping as long as I don't mind spending about $10 per person on dinner, three nights per week. If I've been eating out a lot lately, I can save money. I've read about meal planning services in which I pay a small monthly fee and receive recipes and grocery shopping lists. When my kids were younger, we had set meals that they loved (usually!) and I didn't want to spend money or effort trying a new system. But now that both kids are out of the house, I have more flexibility with my meal planning and have been interested in trying something new. The Blue Apron experiment was fun. But I don't have the time or inclination to cook special meals every night. Still, I want healthy meals, especially as I train for RAGBRAI, a weeklong cycling event across Iowa and a half-ironman. I've begun trying recipes from No Meat Athlete by Matt Frazier and The Daniel Plan Cookbook by Rick Warren, Dr. Daniel Amen, and Dr. Mark Hyman (both available on Kindle). Recipes are available at the No Meat Athlete website and The Daniel Plan Recipe Pinterest Board. that allows me to prep and freeze today, and cook easily at another date. This meal plan (and similar ones for pork, ground beef, etc.) has been developed and sold by Erin Chase of $5 Dinners. These aren't gourmet dinners but they are very good, healthy, and really easy to make. There are no difficult-to-find, way-too-expensive-and-I'll-never-use-this-again ingredients (at least not in the recipes I've sampled). With the freezer-meal recipes, I can make the dinners fresh but I can also toss ingredients in a plastic bag or container and freeze for cooking later. The main benefit of these meal plans is that it takes just an hour or so to assemble a week's worth or more meals. I'm excited because I've found new meals for my rotation. Plus, I can easily prepare and store dinners in the freezer for use at a later date. I think these should also work well to bring someone a meal — either to have in the freezer to prepare and deliver or as a ready-to-cook meal for a homebound friend. I'm just as interested in saving time as controlling my food budget. Saving money can mean more money to invest. Extra time can mean investing more in my family and friends, my pursuit of my hobbies (mainly cycling, running, and for this year, triathlon), and expanding my creative works. How do you save time and money on meals?